Philippa of Lancaster was born on 31st March, 1360 at Leicester Castle, the eldest child of John of Gaunt, Duke of Lancaster (third surviving son of Edward III and Philippa of Hainault) and his third cousin Blanche of Lancaster, daughter and heiress of Henry, Duke of Lancaster and Isabel de Beaumont. Philippa spent her childhood moving around her father's many castles and palaces. She had two siblings who survived the perils of medieval infancy, a sister, Elizabeth, who was born in 1363, who was later to become Duchess of Exeter and a brother Henry, born in 1367, who would later take the throne from his cousin Richard II and be crowned as King Henry IV, the first of the Lancastrian line of Kings. Philippa's mother Blanche died of bubonic plague at Tutbury Castle, in Staffordshire in 1369 when Philippa was but eight years old. John of Gaunt remarried in 1371 to Constanza of Castile, daughter of King Pedro 'the Cruel' of Castile and on the death of his second wife in 1394, he took his former mistress, Katherine Swynford, as his third wife. Katherine Swynford had been Philippa's governess and the pair had a good relationship. Katherine's sister, Philippa Roet was married to the poet Geoffrey Chaucer. John of Gaunt became Chaucer's patron, and he was appointed as one of Philippa's tutors, as well as the reformer, John Wycliffe, Professor of Philosophy at Oxford and the first translator of the Bible into English, who taught her theology. As part of the Anglo-Portuguese Alliance against the France-Castile axis, a marriage was arranged for the 27 year old Philippa to King John I of Portugal. 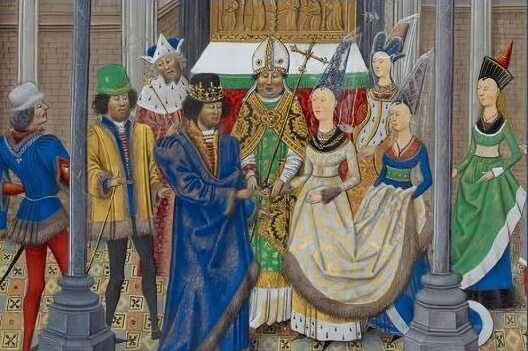 The prospective bride and groom were blessed by the church in the Cathedral of Porto on 2 February 1387 and their marriage was celebrated on 14 February 1387, the couple did not meet each other until twelve days after they were legally married. King John was a rather reluctant bridegroom who already had a mistress by whom he had two illegitimate children. Following the marriage ceremony he left Philippa for the camp of his army to continue with the campaign against Castile. Blanche (1388-1389) - died in infancy. Afonso(July 1390 - 22 December 1400) - died in childhood. Duarte ( Edward) (1391-1438) - succeeded his father as King of Portugal in 1433. Peter (1392-1449) - Duke of Coimbra, who served as Regent during the minority of his nephew Afonso V.
Henry the Navigator (1394-1460) - Duke of Viseu, who guided Portugal to the Age of Discovery. Isabella(1397-1472) - married Philip III of Burgundy. Philippa's suggestion of a conquest of Ceuta would eventually help Portugal dominate in the African spice trade. At the age of 53, like her mother Blanche of Lancaster before her, Philippa was infected with the bubonic plague. She summoned her sons to her bedside so that she could give them her blessing. Philippa presented her three eldest sons with jewel-encrusted swords, which they would use in their impending knighthoods, and gave each a portion of the True Cross, she died less than two weeks later and was buried at the Batalha Monastery in Leiria. Through her son John Constable of Portugal, Lord of Reguengos, Philippa was to become the great grandmother of Catherine of Aragon, first Queen of Henry VIII. 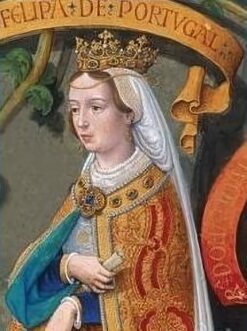 John married Isabella of Barcelos, their second child Isabella of Portugal (1428 - 1496) married King John II of Castile and they became the parents of Isabella, Queen of Castille (1451 - 1504), the mother of Catherine of Aragon.